At a Workshop on 30th April attended by senior officials and engineers from the rail industry, academics from City’s Photonics & Instrumentation Research Centre showcased a patented pantograph instrumented with an array of optical fibre sensors. 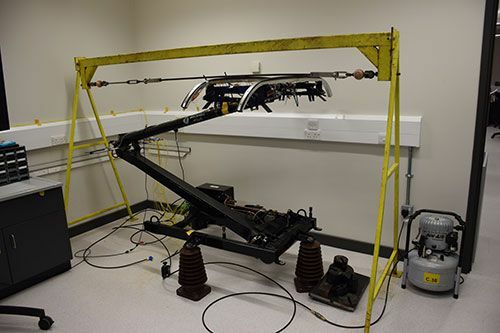 On 30th April, City University London’s academics from City University London’s Photonics and Instrumentation Research Centre hosted a Workshop to demonstrate the design and implementation of its active instrumented pantograph. Over the last four years, a team of engineers from City, led by Professors Tong Sun and Ken Grattan, have collaborated with Mr Lee Brun and Mr Steve Cullingford of Brecknell Willis to develop a real-time monitoring system to ensure a reliable contact between the pantograph and the overhead wire of electric trains. Brecknell Willis are based in Chard, Somerset and specialize in the field of electrification/traction for all types of transportation systems including tramways, metros and railways. The system incorporated into the instrumented pantograph is made up of an array of sensors written into a single length of fibre based on Fibre Bragg Grating technology. The pantograph provides a real-time measurement of both the direct contact force between the pantograph's current collector and the overhead wire and its contact location when running under overhead power lines. Last week’s industry-focused Workshop was supported by the Rail Safety and Standards Board (RSSB). 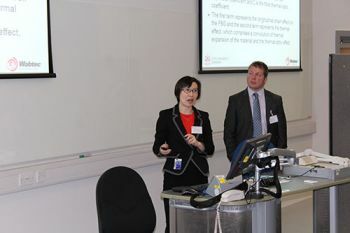 It featured a review of a broad spectrum of optical fibre sensor research activities at City, by Professor Tong Sun and a joint presentation on the design and implementation of the active pantograph given by Mr Lee Brun of Brecknell Willis and Prof Tong Sun, which was preceded by a brief introduction to City and its background over many years in instrumentation research, by Professor Ken Grattan. Twenty external guests, drawn from senior engineering ranks within the UK rail industry attended the Workshop and were given an opportunity to see the pantograph in action in the newly refurbished research laboratories of the Research Centre. The pantograph research was initiated through a 2011 Collaborative Fund grant from the Engineering and Physical Sciences Research Council (EPSRC). A pantograph is a device which collects an electrical current to power an electric locomotive train.